Projector Films - new ideas for film makers: Get heavy! Here's a new idea that explains how I feel about communicating your ideas, selling your ideas and how blogs fit into the whole thing! 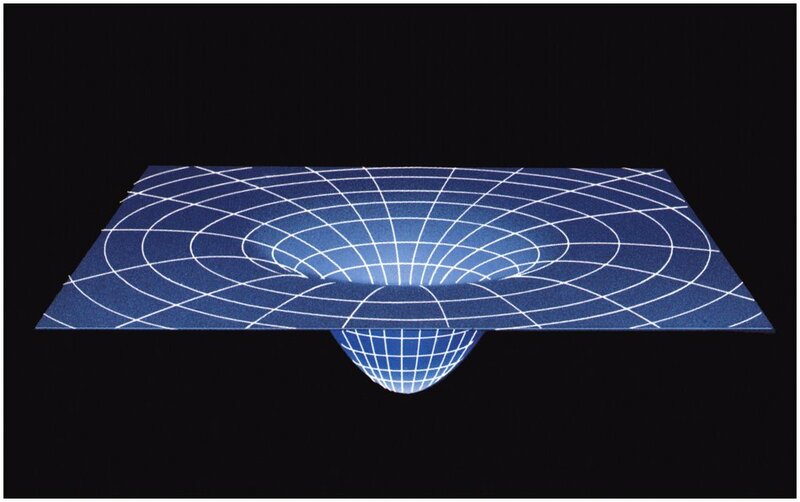 It is based on the idea of how large objects in space bend and distort the universe around them - as Einstein outlined. But stay with me on this. Imagine you are at the centre of your world. A dot on a large flat surface. The people that you need to meet (producers, distributors, colleagues, funders etc) are dotted across this flat surface. But being busy people they are always on the move. One way to touch or influence all these people (and tell them about your great ideas) is for you to dash about at high speed trying to hit these moving targets. Tricky. Another way is to let them come to you. You stay in the centre and you create such an influence on the world around you that you put a dent into this formly flat surface. (see above diagram) Now those little dots dashing about are actually draw towards you as they move. They fall into your gravitational field. Even if they don't actually hit you then at least they can feel your influence. The task therefore is to increase your mass, to make your gravitional field stronger - as strong as you can. Eventually of course, if your continue doing this, the size of the field has to increase. So then more people can see you, more people are attracted to you. How do you increase your mass? Well this is the challenge going forward. Blogs, talks, good work, Cannes, networking... all these things. Sitting at home and putting your ideas, scripts and films into the bottom drawer doesn't increase it! Go for it - get heavy! Of course. You still have to do the hard graft! People who only try to increase their gravity with no hard work are the timewasters who plague our industry. They have the volume - but they don't have the mass. In short - they are full of hot air! hello there! - my name is philcampbell (same on twitter) and i'm developing something called rezpondr which does pretty much was your on about. it's in heavy development right now and i built it so i can concentrate on what i want to do - PRODUCE. We basically bring in all the media to one place, one template with all the content in. No reason we could not expand it in the way you talk about for the different people you need to get onboard. I like that idea.